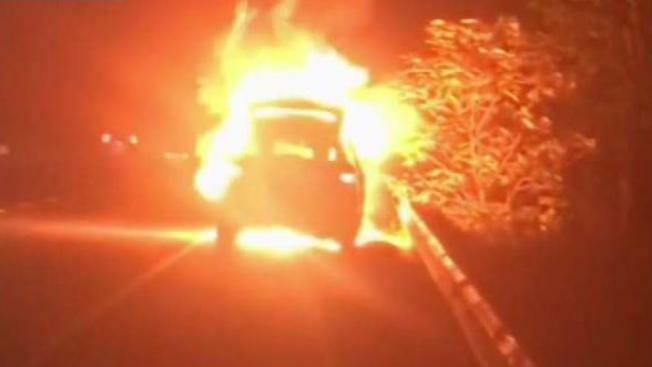 Monique Gooden is grateful that her parents, Walter and Jeanette Baker, are alive after their car burst into flames on a Maryland road — seemingly out of nowhere. "I talked to my mom today and she is still in shock," Gooden said. "She still can't believe that this even happened." Consumer watchdogs may not be as surprised. Their Hyundai Santa Fe SUV is among five Kia and Hyundai models from 2011 to 2014 linked to problems that consumer groups say could be fatal. The Center for Auto Safety called upon federal investigators to probe the complaints after finding more than 200 examples of melting or smoking and 160 incidents of fires not caused by crashes. No recall has been issued. The Bakers were driving home from the beach Sunday on Maryland Route 32 when the trouble began. "They heard some noises or something and then the car cut off," Gooden said. Her parents were too shaken up to speak about their experience. Walter Baker pulled over, popped open the hood and saw the engine was on fire. Jeanette Baker ran out of the car as it started to fill with smoke. "My mom got out of the car and they ran as far as they could," Gooden said. Only moments later, Gooden said, the car blew up and shriveled to pieces. Video shows flames engulfing the vehicle. Police and firefighters quickly arrived on the scene. Anne Arundel Firefighters haven't determined the cause of the fire. The Baker's have been talking to their car insurance company, but have not contacted Hyundai. The National Highway Traffic Safety Administration is approaching a deadline to respond to the watchdog's petition for an investigation. The carmaker said that if the NHTSA finds that additional remedies are warranted, they will take action.